After hot rice and daal at Chhatru for lunch, I managed to doze off in the jeep. Ranvir our amicable driver gave a shout after sometime, “Rama dekh jam laga hai” (wake up Rama, there is a traffic jam ahead). Ramakant ji was the head of our trip! His cry woke us all; there were 7 of us going to Batal from the Manali- Kaza route. At least 20 Sumos and other vehicles were piled ahead of us. One of the Tata Sumos was stuck in the Pagal Nala (mad stream) that comes after Chhatru. Gradually, everyone got out of the jeep, it was only Ranvir and me who stayed inside to be out of cold and the mild drizzle. Ranvir confided in me, “Mein aata nahin Spiti, per rama ko mana nahin kar paya.” (I would have not come to Spiti but I could not say no to Rama). Ranvir was the guy who drove my husband last year to Chandratal as well. At the end of this trip we were making plans for visiting the region next year again and Ranvir readily agreed to drive again, but then I am running ahead of the narrative. After a few minutes Ranvir also walked out. The some 20 minutes later I too was bored. I decided to venture out as well. 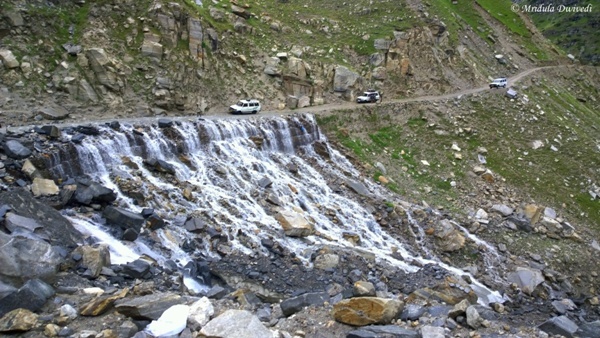 A few kilometers before this jam there was a waterfall flowing on the road (which is a common feature on the Manali Kaza road) and a Qualis was stuck in it. But that one did not take much time to come unstuck. You might have noticed that on these roads jeeps coming from the opposite directions often stop and drivers engage in a chit-chat. That is the only way to get information on the road as there is no mobile signal after Rohtang Pass till Kaza. When Ranvir asked a driver coming from the opposite direction, “road kaisa hai” (how is the road ahead) the other fellow replied, “takatak” (first class). Now standing at the Pagal Nala I was wondering if this was takatak then what would be bad in his definition! Many vehicles that ply on the route have JK or HP numbers. They are the locals, they are the pros. You will find occasional HR, CH, GJ or other numbers and they are usually the rookies, cause of all jams. But this time the Sumo that got stuck had HP number and was named Spiti Express. Most of these vehicles do not have 4WD. There was a small crowd around the immobile vehicle. A rope materialized out of one of the jeeps. 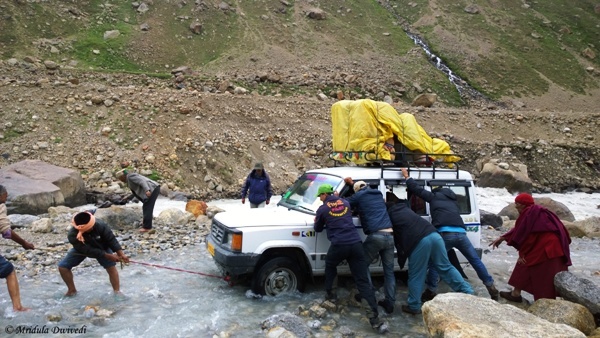 The Sumo behind the stuck vehicle tried to pull it out by tying the rope to both the vehicles. The trouble was that the rope would break. In the meanwhile we spotted 3 city slickers who seemed to be in a hurry. Apparently their vehicles were stuck downstream because of this jam. And all they cared was to get out and drive away using their walkie-talkies for coordination. Why they needed walkie-talkies for coordinating at a distance of 10 meters is beyond me. I always find brashness difficult to take in my stride but it was infinitely more jarring among the gentle people of the hills. Everyone knew that nothing could move till the stuck vehicle came out, other than these three city slickers. However, getting back to the stuck vehicle, a new rope was found and two set of people tugged at the beast. Women joined in the fray. I was so amazed to see them wading in the ice cold water without a second thought or a glance at anyone. All I was good for was clicking pictures and making videos. With the combined effort of these people the vehicle with infinite reluctance, lurched out. Finally we were free to move. It was expected that vehicles going upstream would go first. But our city slickers had other thoughts. They started moving their Fortunners and two other big vehicles downstream first. This agitated people a lot, but the hill folks managed to get them out of the way without creating any other traffic jams. Soon, it was the turn of our jeep to cross the Pagal Nala. Other than Ranvir and me, everyone got out to reduce the load. That meant Ramakant ji, his brother Vishal, my nephew Dilip, our cook for the trip Hemraj ji and Bobby all had to cross the stream on foot. That was not too difficult, only it would leave your feet and shoes wet and cold. It is recommended to take the shoes off as they would remain dry and be a comfort later on. On the first try we got stalled mid way in the nala. I managed to keep the camera on and my eyes closed for most of the time. On the second try we did manage to clear the nala. You can see the entire adventure in the video which was made as I said, with eyes tightly shut most of the time! 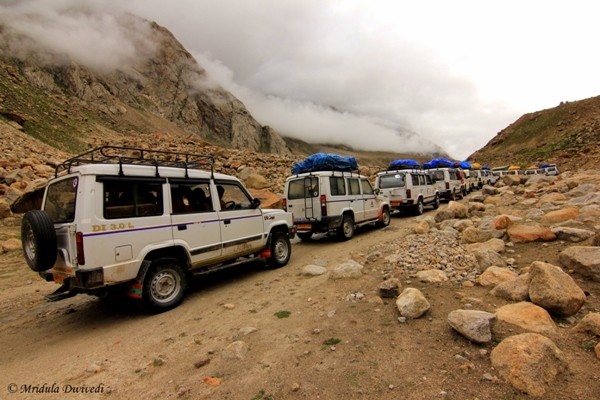 This was the start to our trip to Chandratal. I should have read the omens correctly but then I was too busy being happy that we didn’t end up spending the night by the road or worse still by turning back before even the trip had begin!